A Travel writer based near Pattaya has given a TEDx (Technology, Entertainment, Design) talk about his travel experiences. 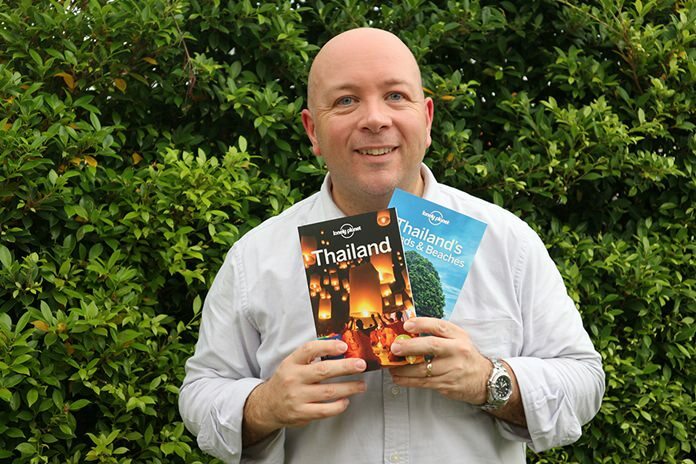 Lonely Planet: Author Mark Beales with the new Lonely Planet Thailand and Thailand’s Islands & Beaches guides. Mark Beales, who teaches at Garden International School (GIS) near Pattaya, gave the TEDx talk in Bangkok. He spoke about how his travel experiences had helped him gain a better understanding of other cultures and people. These included travelling to India to interview victims of child servitude and helping teach hilltribes in Laos. Mark also recently co-wrote the new Lonely Planet Thailand book and Thailand’s Islands & Beaches’ guides. He updated the Koh Chang and Eastern Seaboard chapter for the 16th edition of the guide. This features the famous islands of Koh Samet and Koh Chang and Pattaya itself. Mark said, “Going on the road for Lonely Planet is always a huge thrill. For this trip I was pleased to be able to add some new resorts and uncover some fantastic new places to visit. Mark co-authored the 13th, 14th and 15th editions of Lonely Planet Thailand, and has written several e-books. As well as writing, Mark teaches English language and literature at Garden International School.